I recently heard re-gifting described as “an art rather than a science.” I’d say that’s a fair classification. 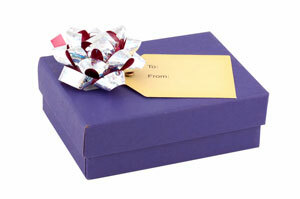 Re-gifting, giving a gift that you’ve received, is very popular among grown men and women. As I pondered the phenomena, I began to wonder why more young people didn’t participate. Generally speaking, the younger you are the tighter your budget can be for things like gifts. I’ve decided to explain the manners and etiquette that accompany re-gifting, and hope that you benefit from this time honored tradition. There are certain items that lend themselves to the practice. Gift cards to local stores (Hint: when I give someone a gift card I don’t put their name on the actual card. This way then can more easily give my gift away…I’m okay with that), iTunes cards, accessories (watches, belts, scarves), games (if electronic make sure that the person you’re giving it to has the system to play). Giving should be from the heart, make sure that you’re giving the gift because you think the recipient will appreciate it, not to satisfy your need to hand them a box with a bow. I only know one way to put this. Don’t clean out your closets or bathroom cabinets for items to give. Perfumes and bath items have a short shelf life, resist the urge, even if you’ve never opened them. The best time to give them away is the same season in which you receive them. Or, even better, if you return such items and get a gift card or store credit, your friends and family can go in and pick out the scent (or un-scent) that they like. You don’t want to hurt someone’s feelings by giving their gift away. Make sure that you re-gift outside of the family or circle of friends from which you received it. Bottom line, this is a great way to save money on gift giving. I’m not suggesting that you give every gift away, but chances are you don’t really need much of what you receive. You’ll be giving yourself the gift of savings.